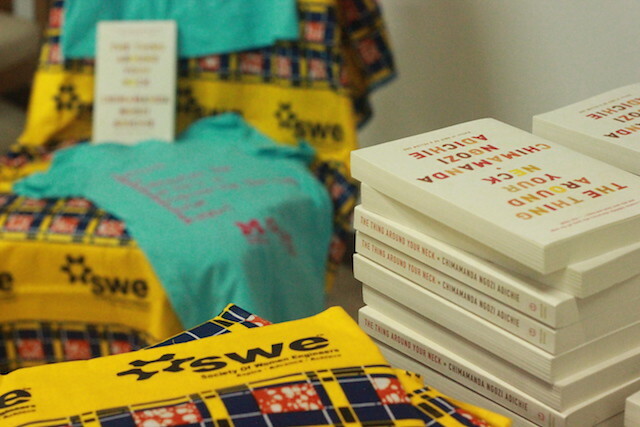 L-SWE SUCCESS Day 6: Flag Day! Monday, August 27, is a national holiday in Liberia. We took the morning off in observance. In the morning, several of the UM students went to visit the market in Kakata to buy lappas (a term describing printed cloth used to make African clothes, usually sold in “lappas” or 1-yard lengths). 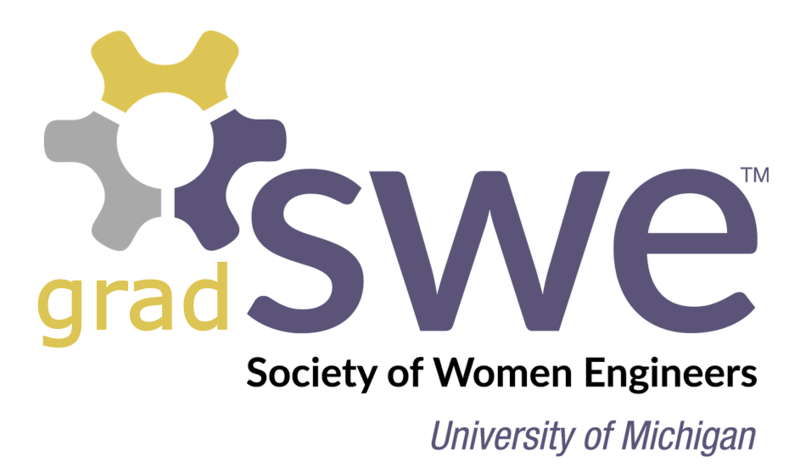 Some students opted to lounge for the morning, sleeping, “lecturing” (casual conversation), or crafting SWE printed hairties for the group. In the afternoon, our second engineering activity of the camp commenced! Sahithya introduced the Delta Design project, an imaginative housing design project set on a different planet. Each Delta Design team had members assigned the role of structural engineer, thermal engineer, architect, and project manager. The roles had complex tasks that they were trained to do for the team in order for each design to be the best. 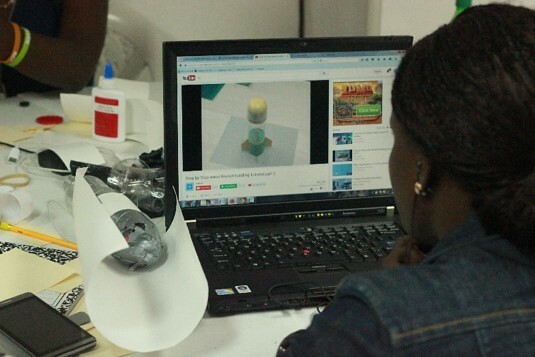 In comparison with the Bottle Rock project, the Delta Design project was intended for the students to work in interdisciplinary teams, where they had to work with and depend on experts outside of their own fields, communicate their results to others with potentially conflicting interests, and trust each other’s recommendations. After a grueling afternoon of calculations, its was time for…. L-SWE SUCCESS Day 4: Bottle Rockets! Today was a day dedicated to completing our first engineering activity! Each of the teams were build their own bottle rocket, and compete against other groups to see whose design was the best. The theme of the weekend is “working together”, to focus attention on group dynamics and effective teamwork in engineering. At 9am, we setup the materials for bottle rockets. 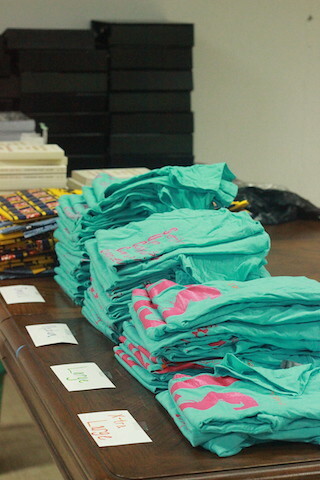 After breakfast, all the teams came in to grab their materials and get to work. After about an hour of prepping, we took a break to welcome our first guest speaker of the camp. 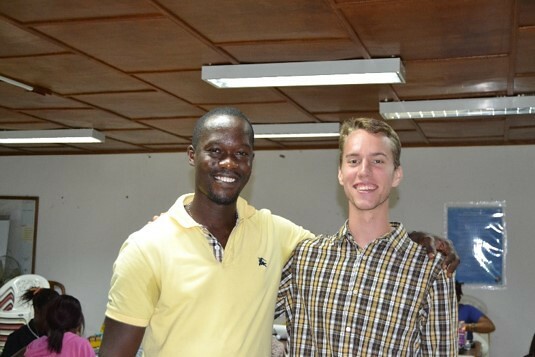 Peace Corps Liberia Training Director Zayzay Miller (left) and Peace Corps volunteer, Kris (right). 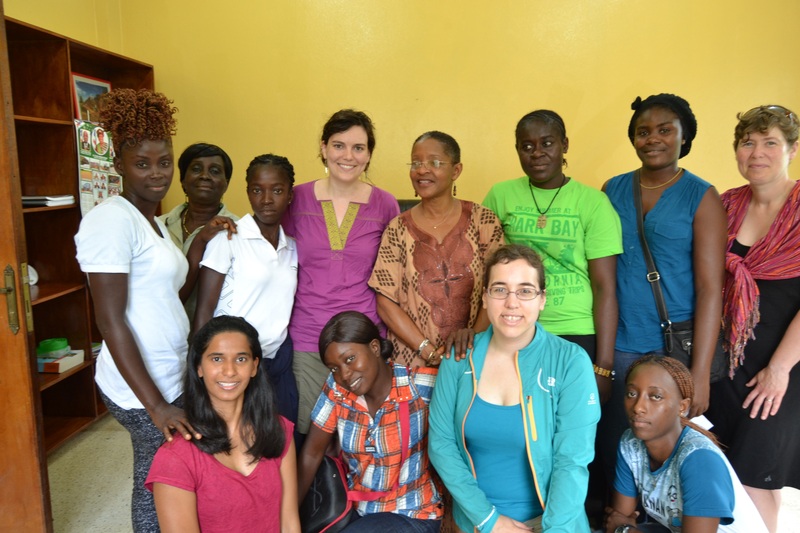 Zayzay Miller is the Training Manager of Peace Corps Liberia. 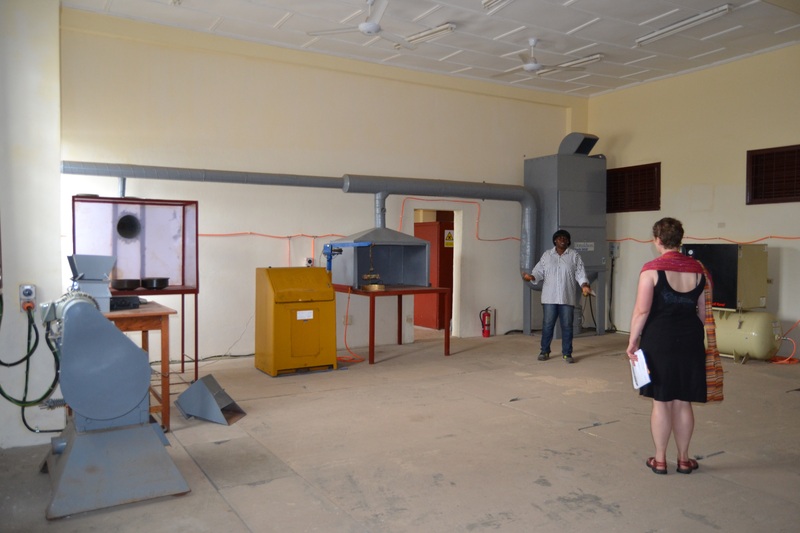 His office trains new Peace Corp volunteers, coordinates volunteer assignments, and manages the Peace Corp properties. 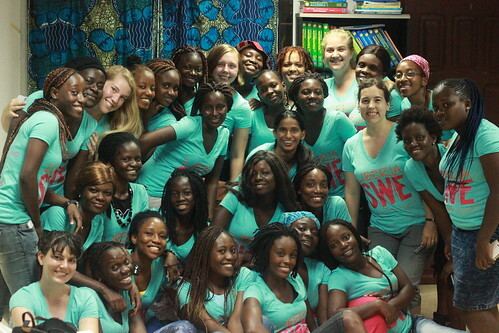 He came to talk to the L-SWE women, however, about his previous work as a volunteer in the Liberian Youth Corps. He shared his experience as one of the first cohort of Youth Corps members, which functions similar to AmeriCorp in the US, where young people who are college graduates commit 2 years to serve in communities in need. 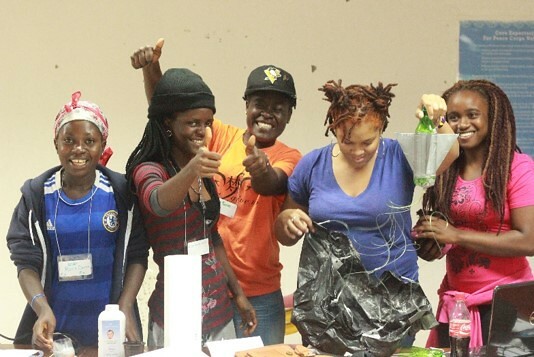 Zayzay encouraged students to think about alternative career paths after graduating from college, since the employment situation in Liberia is rather bleak and it could be difficult to get jobs straight out of school with no prior work experience. It was interesting to hear about the Peace Corps work, and the national volunteer service that it inspired. Most of the us had no idea what the Youth Corps were before the talk, and it seemed like it could be a great opportunity for people to gain practical skills in engineering, and also in community organizing around engineering projects. After Zayzay’s talk, and a Q&A, the bottle rocket building resumed. The goal for the teams were to get a rocket that spent the longest time in the air between launch and hitting the ground. Teams worked diligently all afternoon, just barely taking a break for lunch. Since we could only use the limited materials the UM team had brought in our luggage, the teams had to be conservative about the materials they used for their rockets. It was quite an ordeal actually to get the right bottles for the rockets– we had to find sodas in plastic bottles in the market that were roughly the right shape and size for a rocket. The logistics team was planned ahead, and we recycled the bottles from the drinks provided at orientation to use for the rockets. However, it was a constant battle with the hyper-efficient cleaning staff at the camp to keep the bottles from getting thrown out. Sahithya tried valiantly to distinguish the stash of empty bottles from other trash in the room, but on Friday morning we were bested by an early morning trash sweeper. After the first batch of bottles were thrown out, we bought more Coke and Fanta bottles, but the Fantas turned out to be too round at the top once teams started crafting their rockets. So we had to go out and get Coke and Sprites. 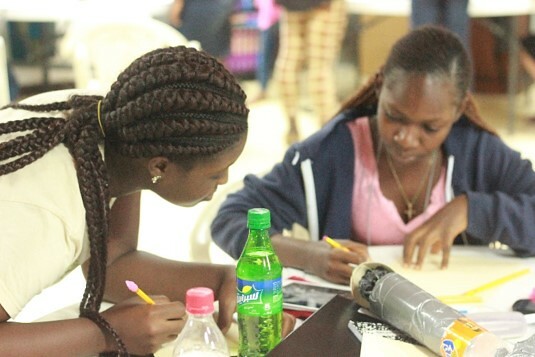 Eventually, each team had enough materials to make two rockets, either to test two different designs or to use as a prototype and a competition model. The night before, the students had eagerly looked up Youtube videos of bottle rockets to get an idea about what they trying to do. From there, ingenuity abounded. Teams got to test launch their rockets later in the afternoon, and even though it was raining, the teams stayed outside testing and tweaking their models for hours. Most of the teams got good launches and a strong vertical start, but all the teams struggled to get their rocket’s parachute to deploy. Since getting the parachute to deploy would greatly increase their time in the air, the teams worked really hard to refine their designs to get that parachute done. Next week, we’ll do the competition, and we’ll see who’s design works the best! 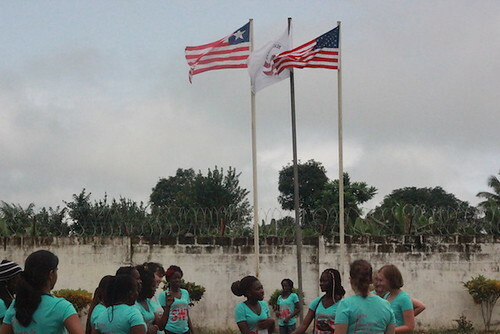 On Wednesday, we welcomed the Liberian students to the camp. 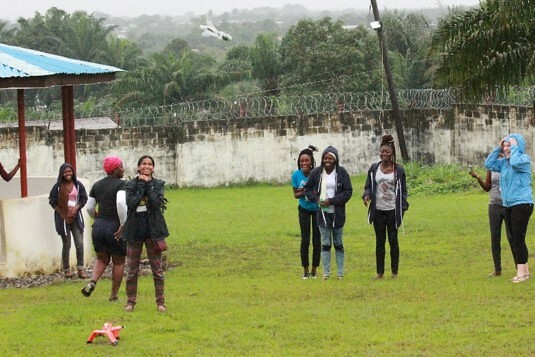 They came from across Monrovia and the surrounding areas, and all are undergraduates at the University of Liberia, Stella Maris University, and St. Clements University College. As we waited for them to arrive, the UM team unpacked our materials and setup the classroom where we would be conducting most of the seminars and activities. A few of the Liberian members of the Logistics team, along with the undergraduate SWE members took a trip to the market to gather some last additional materials for an engineering activity later in the week. 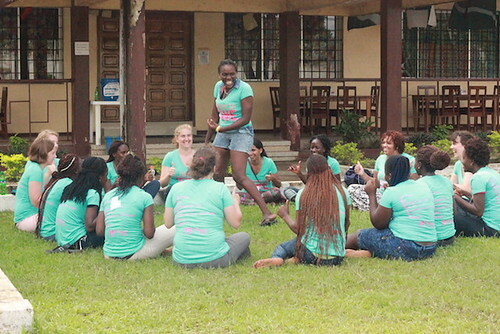 The students came in two waves, with one bus (shepherded by “Boss Lady” Edith) arriving in the morning just before lunch, and the second arriving just before dinner. To get to know each other and start the camp off right, we spent the afternoon playing games to learn each other’s names and share a little bit of culture. My favorite, was Lappa: similar to dodgeball, but instead of only concentrating on avoiding the ball you also have to match up and straighten a pile of shoes. When you get hit, you tag in another person from your team, relay style, and they continue the straightening effort. When you finish straightening, you count the shoes (all of them, before the other team interrupts you by throwing the ball). When you run out of players to tag in, the round is over and the teams switch places. 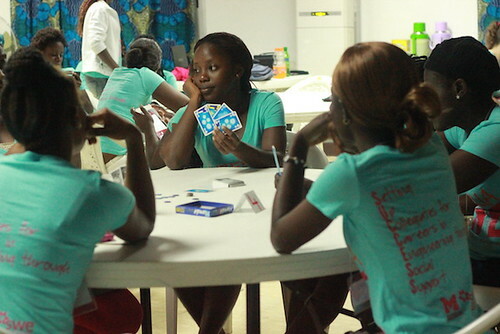 After an afternoon of games, we started orientation in the evening. After introducing the camp and its purpose, every planning team gave a short presentation about their part of camp logistics. Some students opted to join a couple of the planning teams to continue helping out with camp throughout the next couple weeks. It looks like it will be a great few weeks!